Oil Painting Medic: How do I Paint Porcelain in my Still Life without it Looking like Clay? How do I Paint Porcelain in my Still Life without it Looking like Clay? A still life with ceramics may challenge the artist wishing to achieve smooth blends in oil paint. But regardless of how carefully the paint is applied, unwanted brush marks and chromatic ridges remain. Dark crescents seem to inhabit spherical teapots; colour-streaks blot porcelain vases. 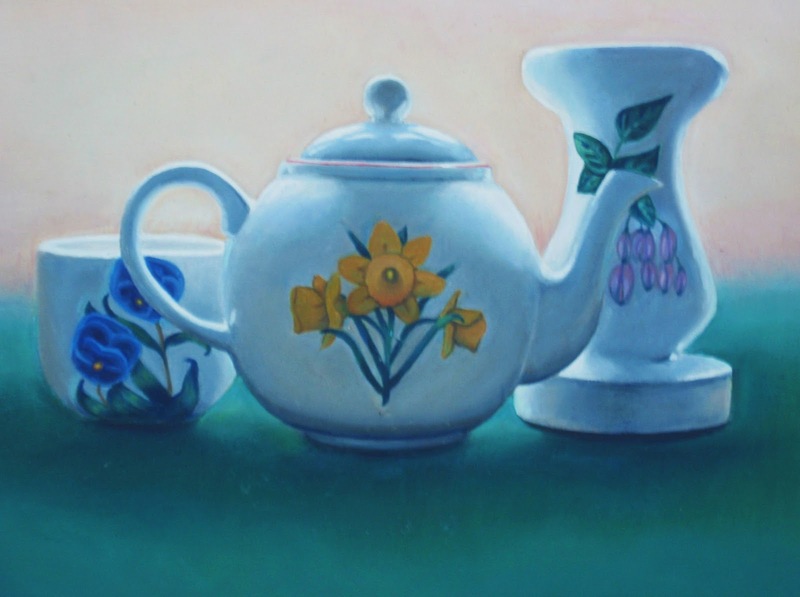 How can a smooth finish be achieved in still life oil paint to suggest porcelain, glass or chinaware? Applying oil paint alla prima, or in one layer, will often exhibit broken glazes, uneven paint layers and brush marks. The effect is enhanced if applying dark paint over a white painting surface or over an under-glaze of a conflicting colour. Thinner areas will reveal the colour beneath, resulting in a sketchy or unfinished look to the painting. Using bristle brushes will inevitably leave brush marks over the paint layer, which is more suited to expressive or breezy type of oil paintings. Adding increasingly thicker layers of oil paint in a bid to correct imperfections beneath will result in an unwanted impasto effect that will not be in keeping with a smooth finish that suggests chinaware. Using coarse canvas or an art surface with dried impasto will make suggesting the smooth surface of porcelain more difficult. In fact, achieving smooth blends in oil are often difficult when working in alla prima, particularly if the subject matter depicted is of a conflicting tone or hue to the art surface. Applying an under-glaze of similar colours to the subject matter will provide the ideal foundation for creating smooth effects. A still life consisting of chin-blue objects, for instance, may benefit from an acrylic wash consisting of ultramarine and white. This will eradicate unwanted white areas from poking through the paint layer. If the porcelain is pale, apply a thin wash of pale blue acrylic paint to eradicate the white art surface from showing through the first layer of oil paint. This will also help the artist judge tonal values in the porcelain more effectively. Begin with the mid tones, which might consist of white, ultramarine and a dab of burnt sienna. Apply this paint in moderate amounts via a fine sable brush. Work towards the highlights by adding progressively more titanium. In similar fashion, work towards the darker areas by adding a little more ultramarine and burnt umber. Don’t add a new pigment all at once, but a little at a time Work over the painting to eradicate unwanted ridges in the paint, accepting that the blends will never be perfect. Stand back from the painting to ensure no unwanted tonal divisions, otherwise invisible close-up, can be seen in the painting. Allow the painting to dry, and then repeat the previous step with a translucent layer of oil paint which might be thinned with a little linseed. Again, work over the painting with the objective of creating smooth blends. The underlying paint layer will work with the upper layer to create a more perfect finish. A third layer of oil paint can be applied once this second glaze is dry. The artist need not cover the entire painting with the overlying glaze, but areas that require special attention, such as tonal shifts on cylindrical or spherical ornaments. Use a soft sable throughout. Extra smooth gradations can be achieved by applying a thin layer of paint via the pad of a clean soft rag. Dab over the layer ensuring only a clean area is in contact with the painting when shifting the colour mix. Lightly brush over this layer with a wide soft sable. Finally, stand back from the painting to ensure the overall effect is satisfactory. Super-real effects on chinaware, porcelain or ceramics need not require hours of painstaking blending, but several short sessions of oil painting. The secret to achieving smooth gradations in paint lay in the consecutive layers of thinned paint glazes. The first layer can be worked over to eradicate imperfections and to enrich colours. The finishing touches may consist of dabbing a soft, clean cloth over select areas of ornaments for an airbrushed effect in paint.